The only Supplier/Vendor solution with Real-time Integration to the Dynamics ERP out there. Greater transparency, reduced redundancy and manual errors with automated and centralized platform for collaboration. Ready process to request, vet and approve new vendors online. A complete solution for Procure2pay process online. Secure platform with Real-time communication between the portal and NAV. Documents Upload/Download functionality for vendors to instantly download, sign and attach any contracts, RFQs or any business specific document. Portal's unique document management feature allows to display and manage all documents online. Ability to view, save as pdf or print any historical Quote, Order or Invoices. A self service portal with access to all documents online. 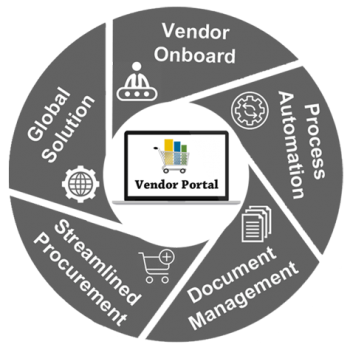 DeS implemented a Supplier/Vendor Portal to provide a self-service platform for their vendors to manage Purchase Order, Quotes and Invoices. Customized screens, Business documents Upload/Download functionality, Complicated Reporting and Statistics tool, Alerts and notifications on activities etc. A full-fledged portal implemented with Multi-company and in Multi-currency with Vendors accessing it all across the world.